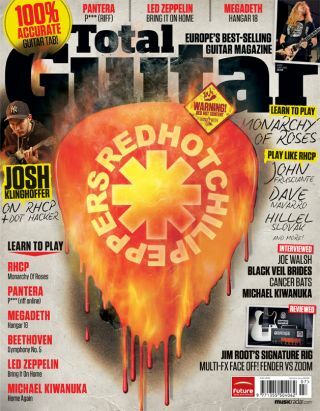 The new issue of Total Guitar is on sale nationwide (and, digitally, around the world) from today. This issue, we speak to Red Hot Chili Peppers guitarist Josh Klinghoffer about his career, gear and what it's really like playing guitar in one of the biggest bands in the world. Josh Klinghoffer talks us through his amazing career to date, from dropping out of high school to joining the Red Hot Chili Peppers. We've also tabbed 'Monarchy Of Roses' in full, plus we show you how to play like the Chili Peppers! We show you how to put together your first pedalboard, including how to power it, the order to put your pedals in and why using Blu-Tack on your stompboxes is a bad idea!